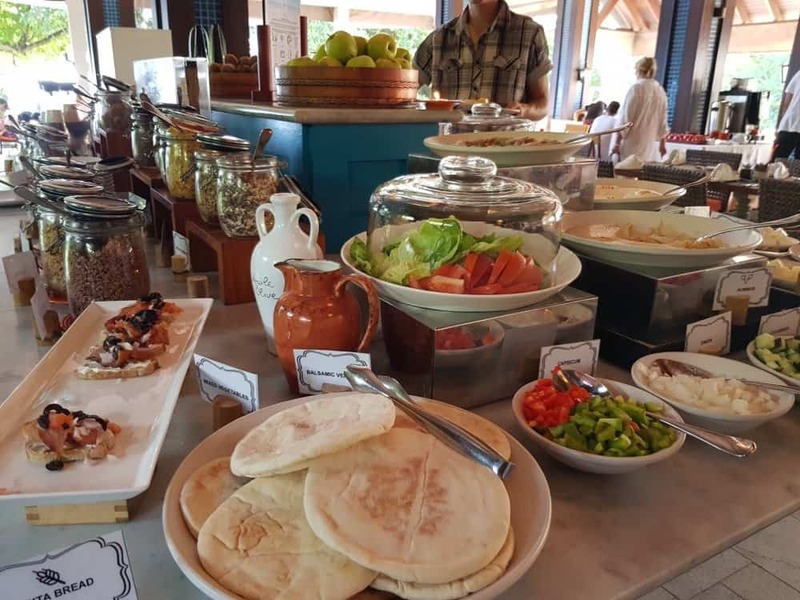 On our trip to Seychelles, the second hotel we stayed in during our holiday was The H Resort Seychelles which is set on a beautiful beach with full private villas, perfect for a halal holiday or a honeymoon. 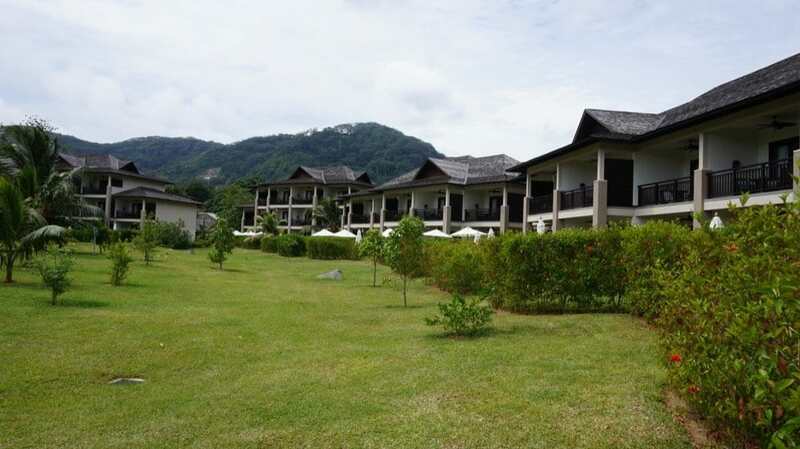 The resort is located on the Beau Vallon beach which offers 3km of beautiful white sand beach. 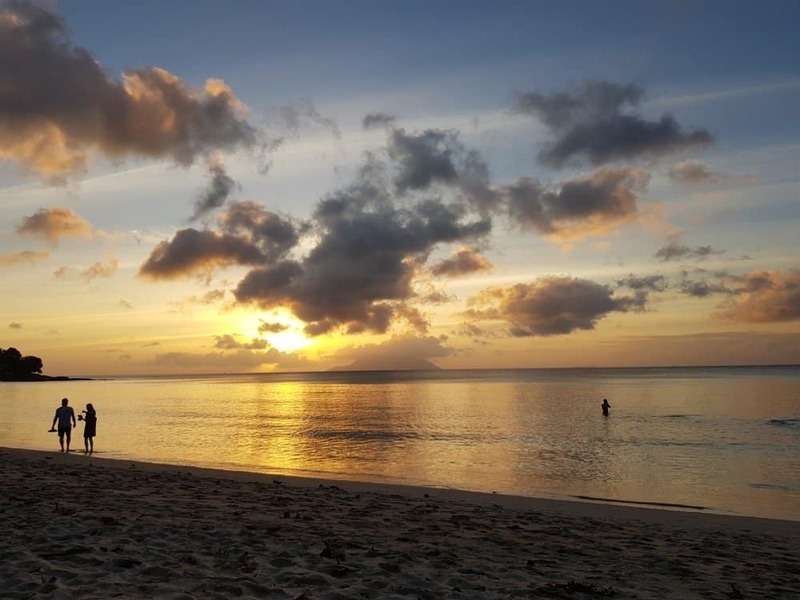 It is one of the best public beaches on Mahe island where you can enjoy fun watersports and the weekend comes alive with people and it’s a great place to see locals as well as tourists. 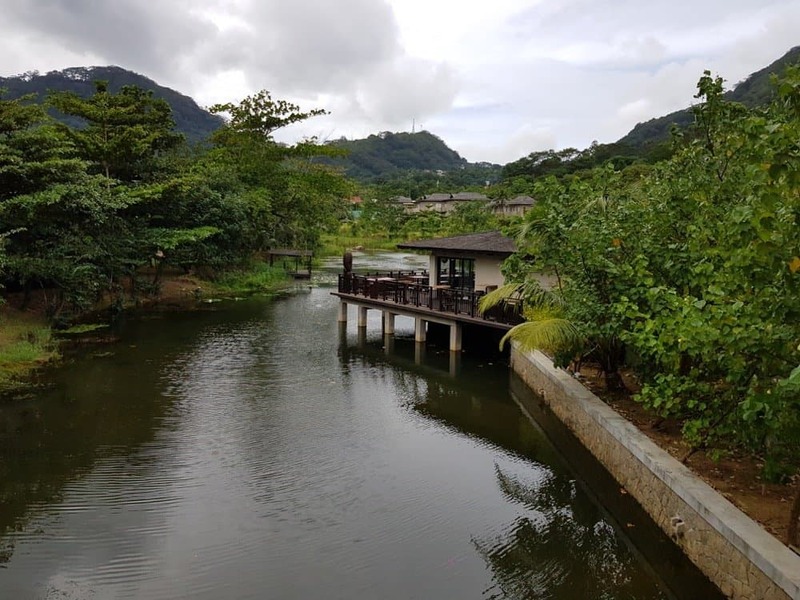 The resort is nestled within the lush green garden set right on the beach and its own small lake pond running through the property. Although close to the action and Victoria it felt peaceful and relaxing. The property is owned by a UAE based group and has the same name as the H hotel in Dubai and several others around the world. 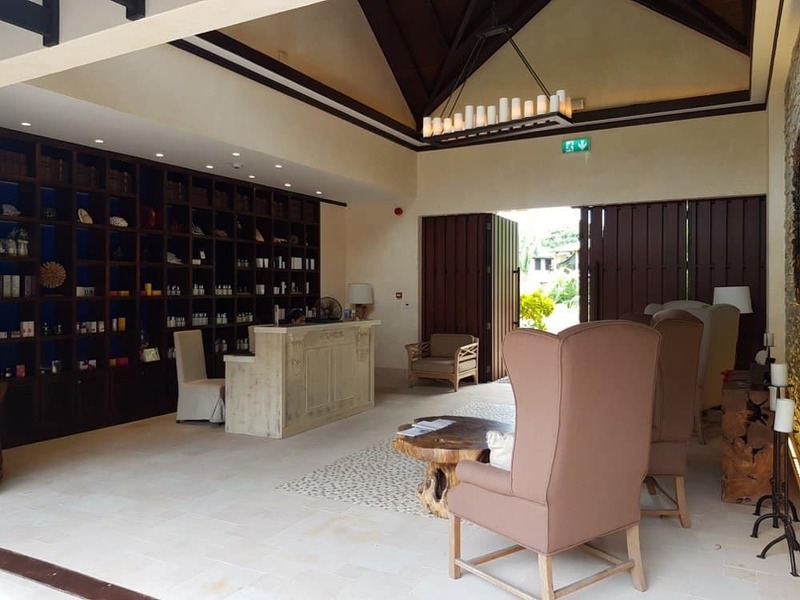 Upon arrival, you have to enter the lobby via the stairs which gives you a nice open feeling of entering the property in holiday mode. The reception desk staff were helpful and we had an efficient check-in while sipping juice and waiting for our room. 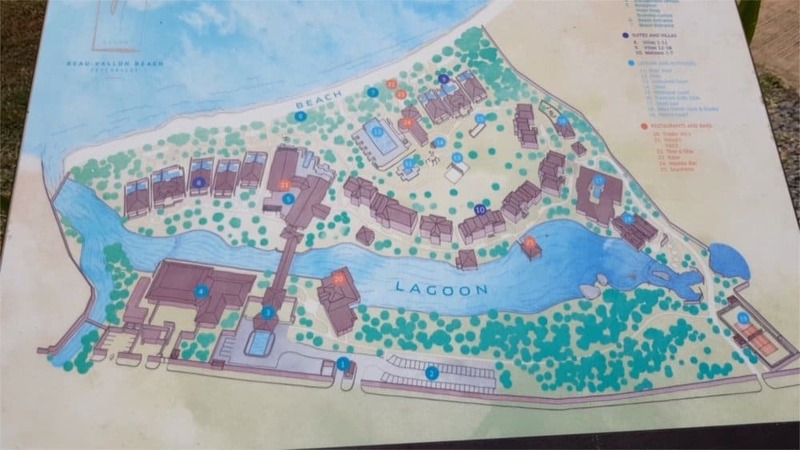 The resort is spread out in different blocks which makes it nice for long walks around the manicured garden, beach and lake that runs through. 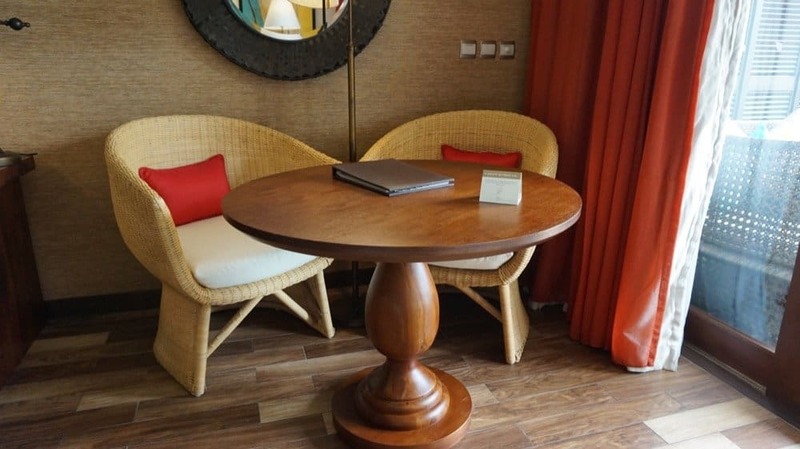 The rooms or suites either have sea view on the top floor or they have garden access like our suite. 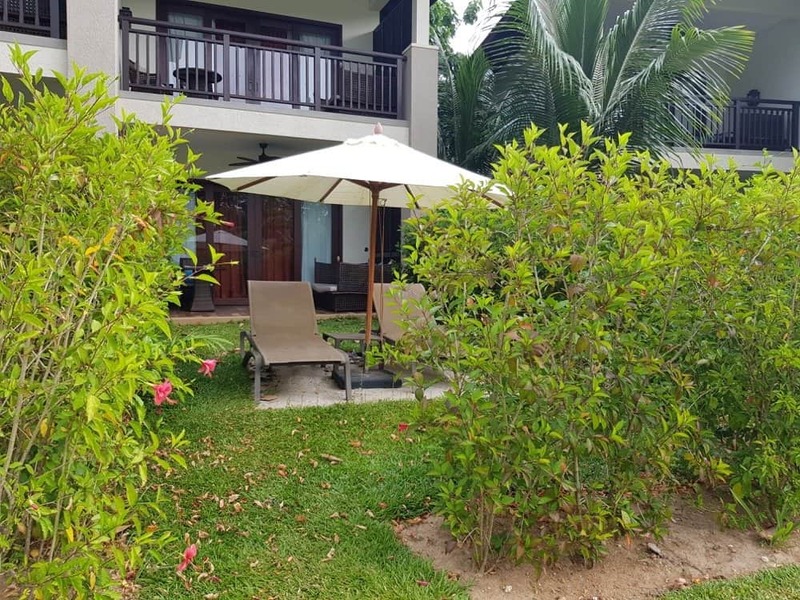 There are also several villas with private pools with the best private options I have seen so far for halal honeymoons plus they are with direct access to the beach. 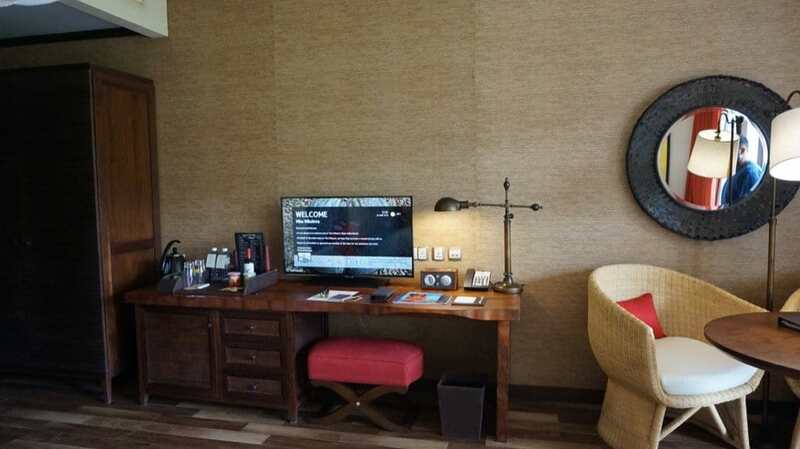 After check in we were taken to our room which was a Garden Suite with a balcony and also had garden access. 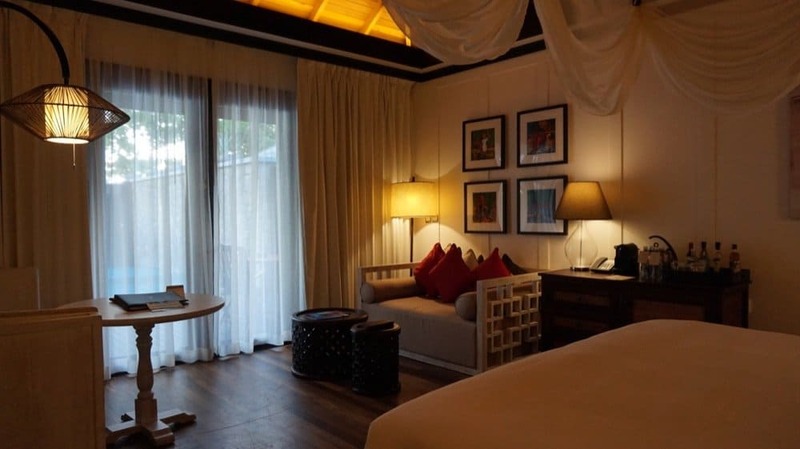 The room was set in wood tones which matched the island feeling and we had a nice four poster bed which was extremely comfortable. 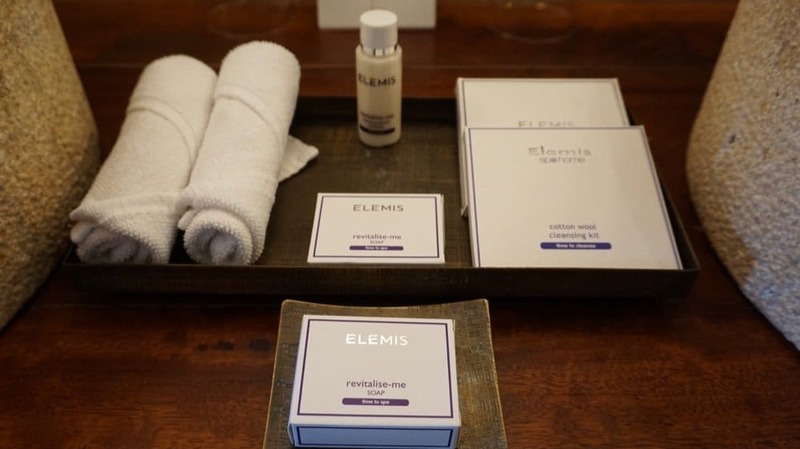 The bathroom was spacious and the products in the bathroom were Elemis. 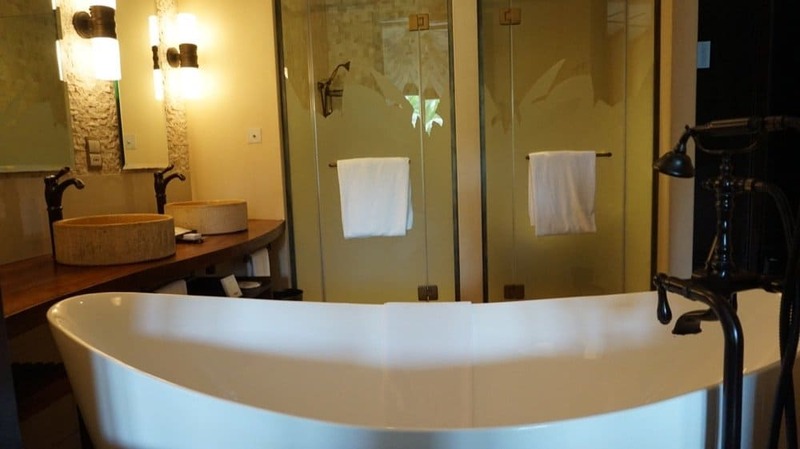 One thing that I have written about before however is the zero privacy aspect you have in many hotel rooms when it comes to bathrooms. I understand it is a design feature but I do appreciate having a door. This was not the case in this room however and I did feel a little exposed. 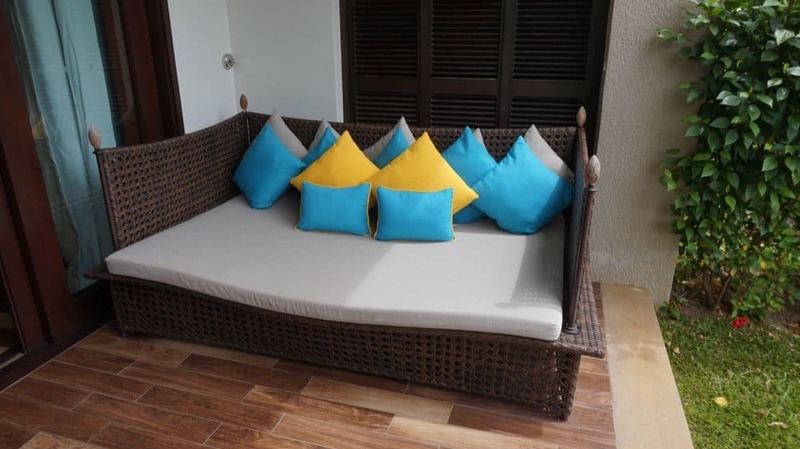 If you have no privacy issues with your spouse I guess you are ok.
One thing I loved was the outdoor space since we had plenty of it, we had a nice big daybed which I used to sunbathe on with a small trick, dining table as well as sunbeds and an umbrella further down. The garden was open with direct access to the garden as well as the pool and beach but it wasn’t the most private spot. 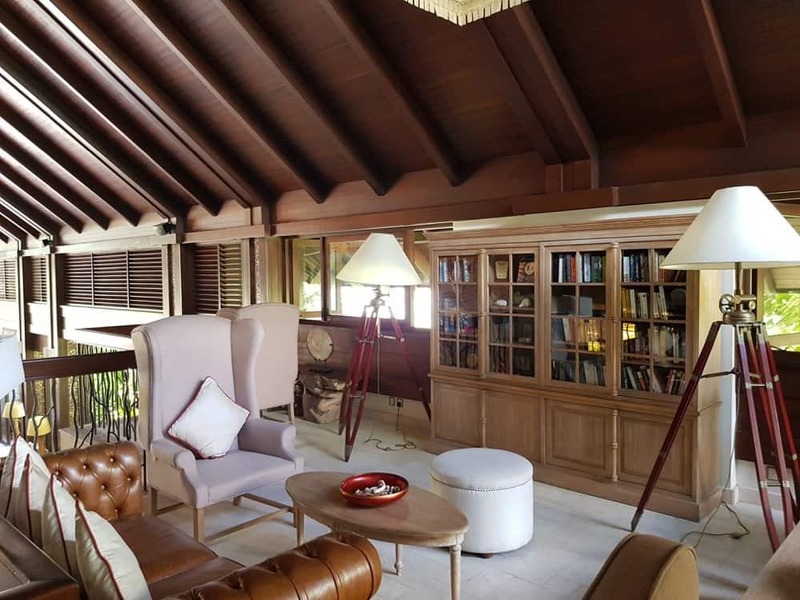 The rooms above do overlook you and also you can be seen from the resort’s garden when people walk past. As we were in the middle of the resort block I didn’t use the sunbeds. However, I did use the amazing sunbed we had which I turned around hiding and blocking the view from the garden and then sunbathing there. This was my DIY hijab free version and I really enjoyed it since I couldn’t be overlooked. 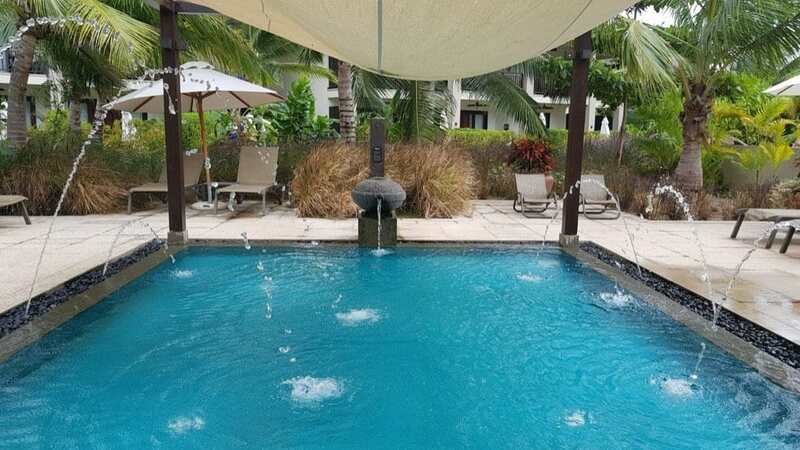 I also enjoyed the fact that I did have direct access to the pool and beach as this comes handy when you want to take some towels to make your own “private castle”. Breakfast had good options and it was served in the main restaurant. 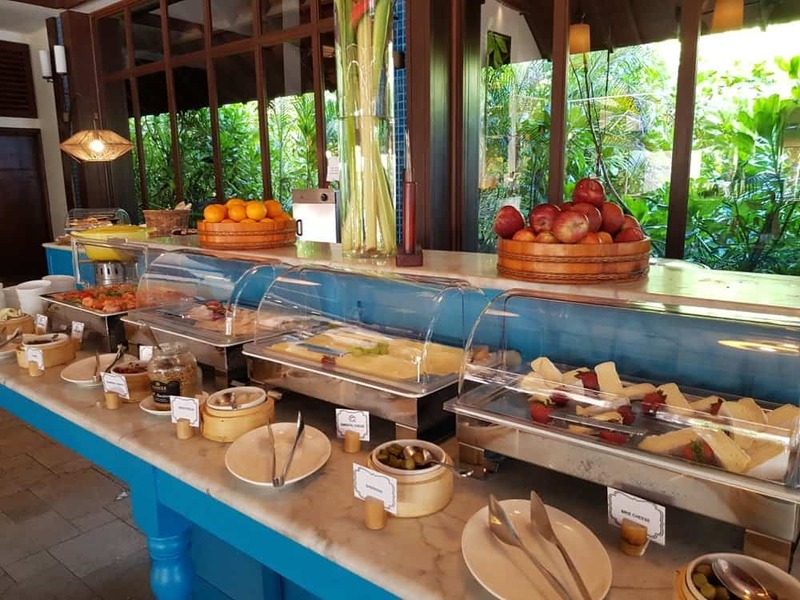 It was a buffet style breakfast and it offered the usual varieties of fresh fruit, cold meat and cooked eggs. I really liked the fact that their pork station was separate and not mixed with anything else. I think it’s a great idea to ensure that food doesn’t get contaminated. 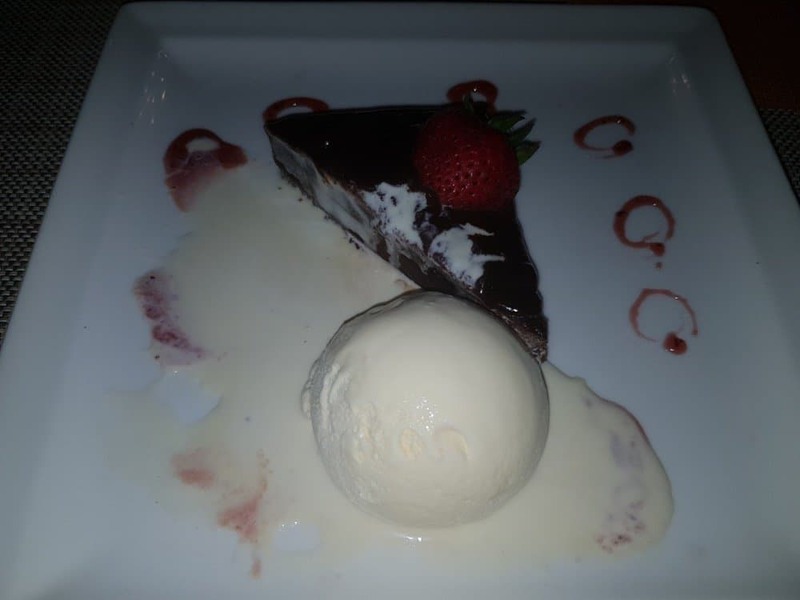 The service in the restaurant can improve a little bit as I mentioned before customer service is not the Seychelles strong point. 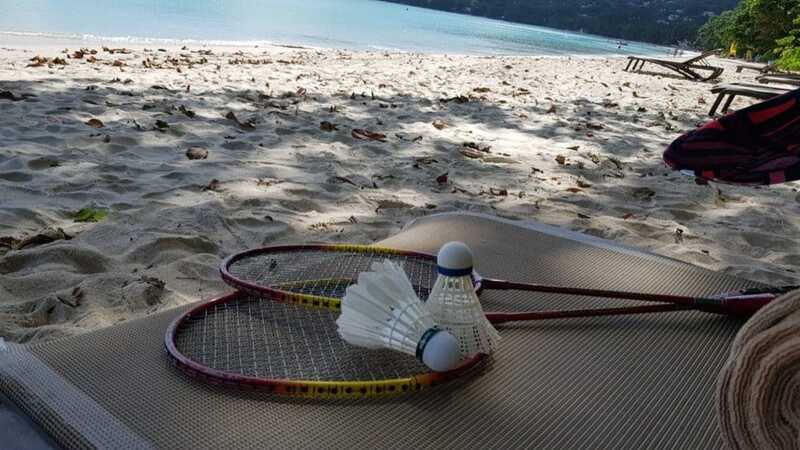 It is a way more relaxing pace of life and I guess when you are on holiday you don’t mind this. 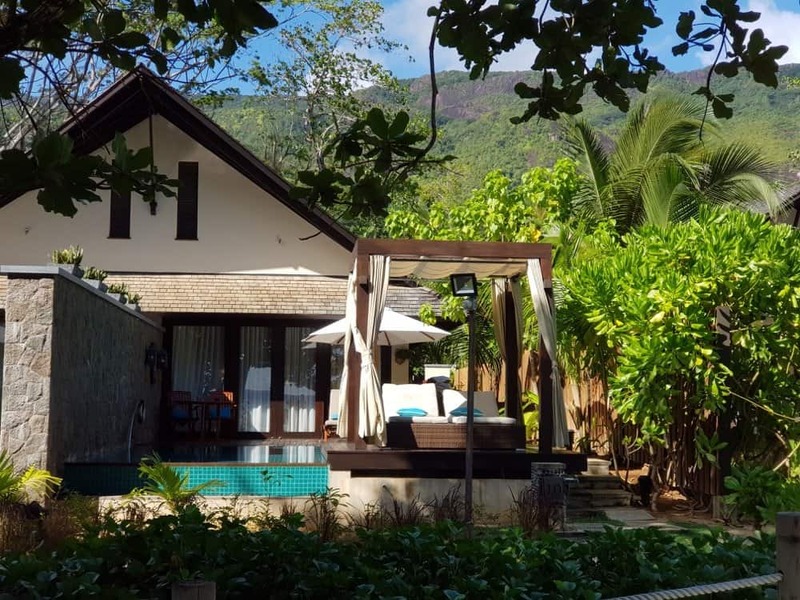 My favourite thing about the H resort apart from the relaxing vibe on the beach were the private villas. 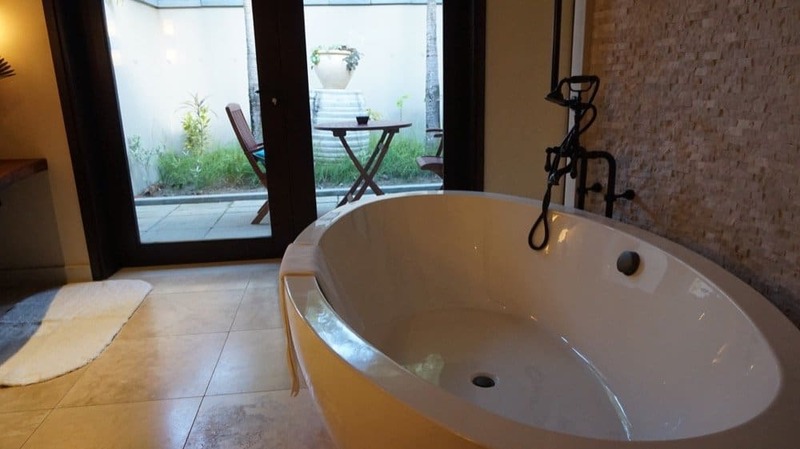 They only have three of these villas so if you really want one you will have to book in advance as they are very much worth it in my opinion. 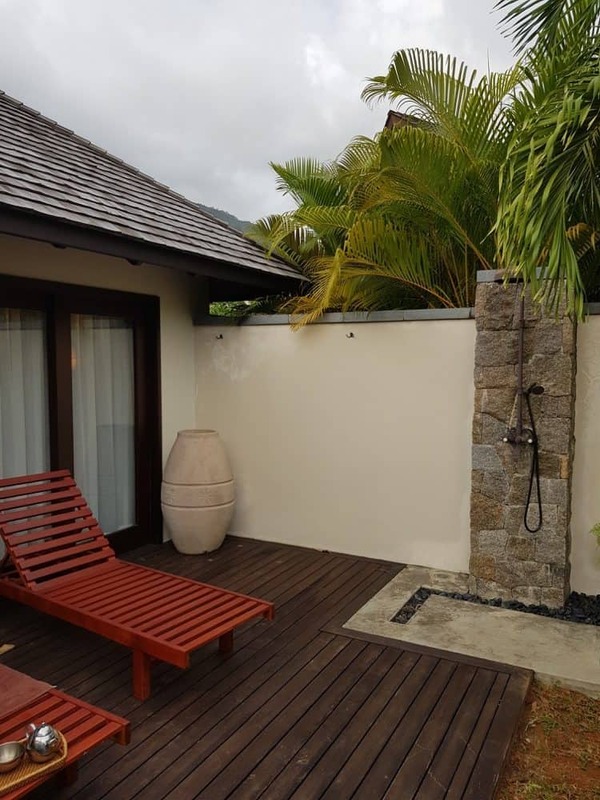 The H resort Seychelles has a lot of Middle Eastern clients and of course, privacy is important. 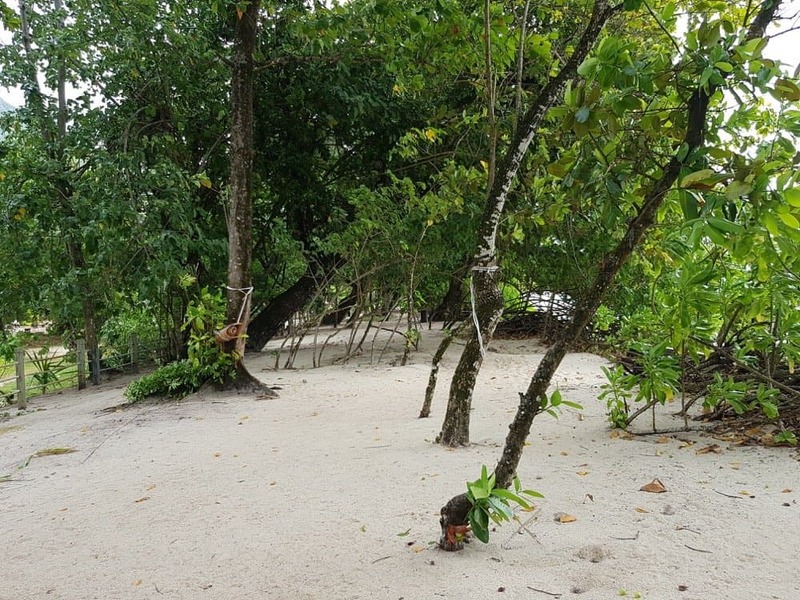 They do have private pool villas but they are next to the beach and of course, you can see into them, so really for the purpose of a Muslim friendly holiday they are useless. 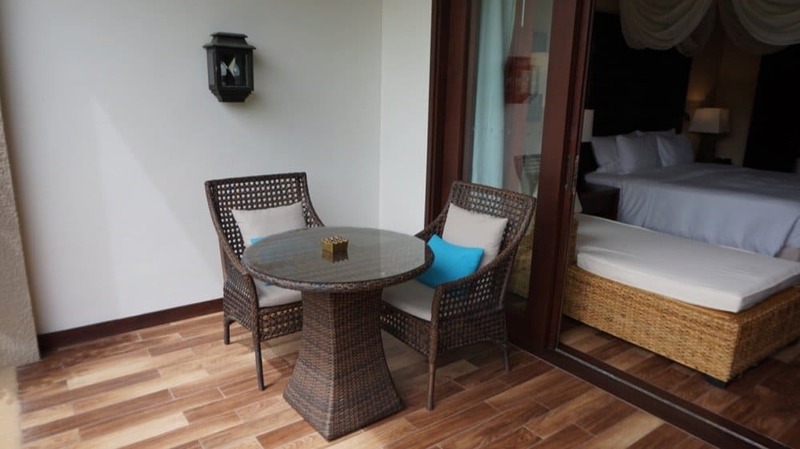 However, they also have three villas that have a wonderful partition that separates them from the beach offering total privacy for you and your family. 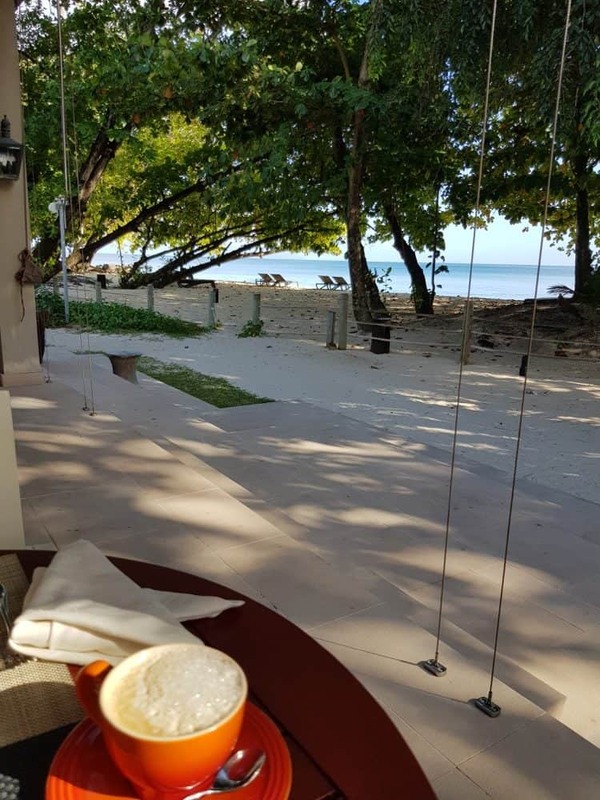 The villas are right on the beach so you can also open the partition and enjoy the view when not using the pool or sunbathing. 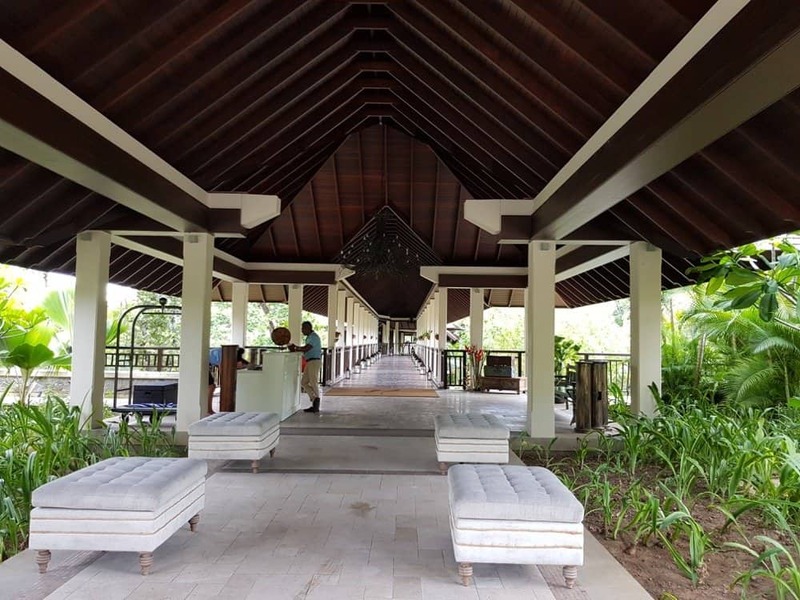 They also offer direct access to the beach from the front of the villa so you don’t have to walk through the resort. 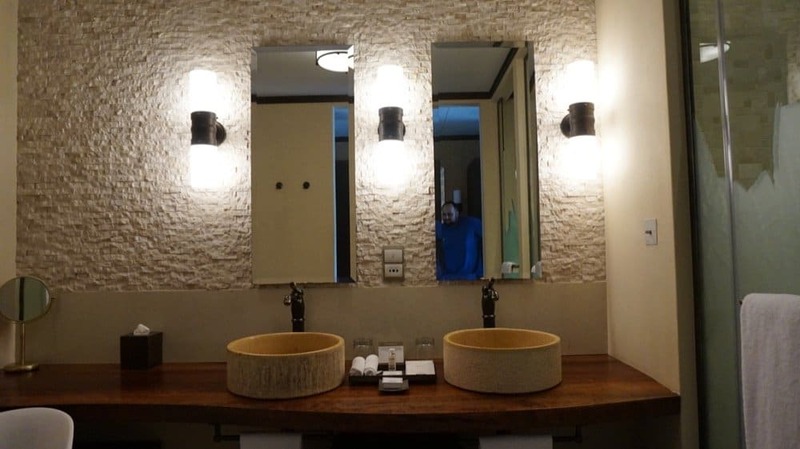 The decoration was beautifully done with a separate seating area and properly closed bathroom doors. 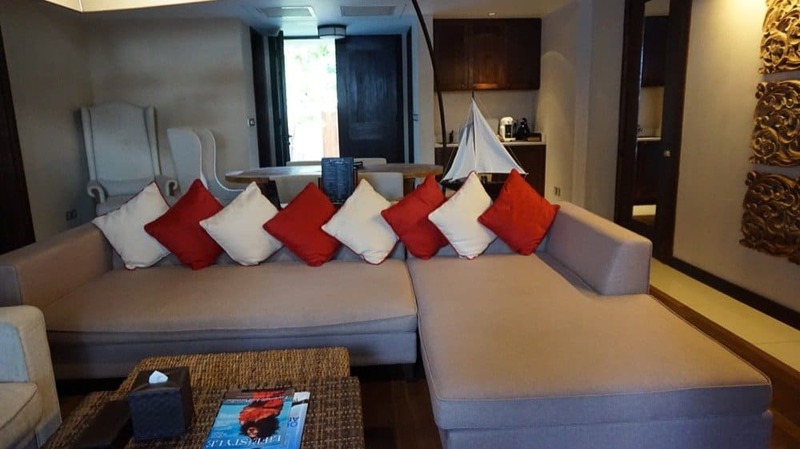 🙂 They are also great for families since two of the villas are connecting and if you are travelling as a large group of friends you can enjoy the space together. 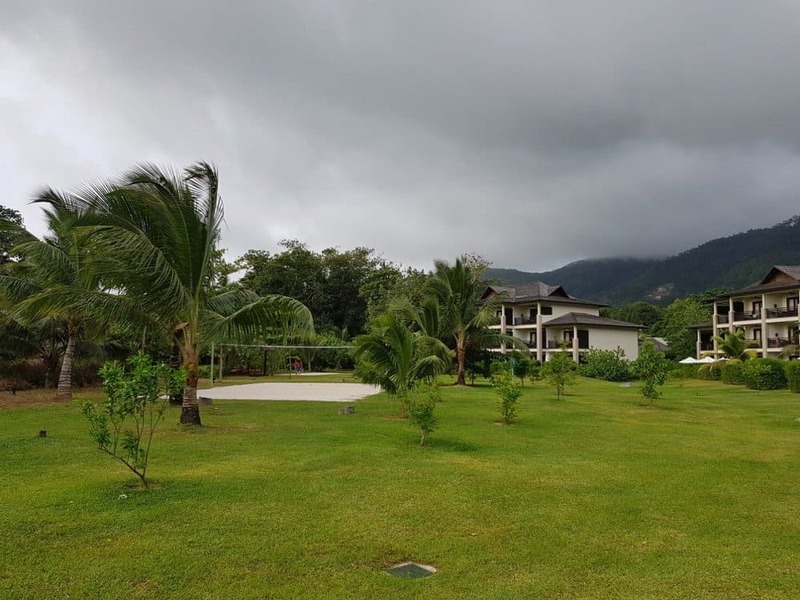 For me, these were the most private Muslim friendly villas in the Seychelles I saw. 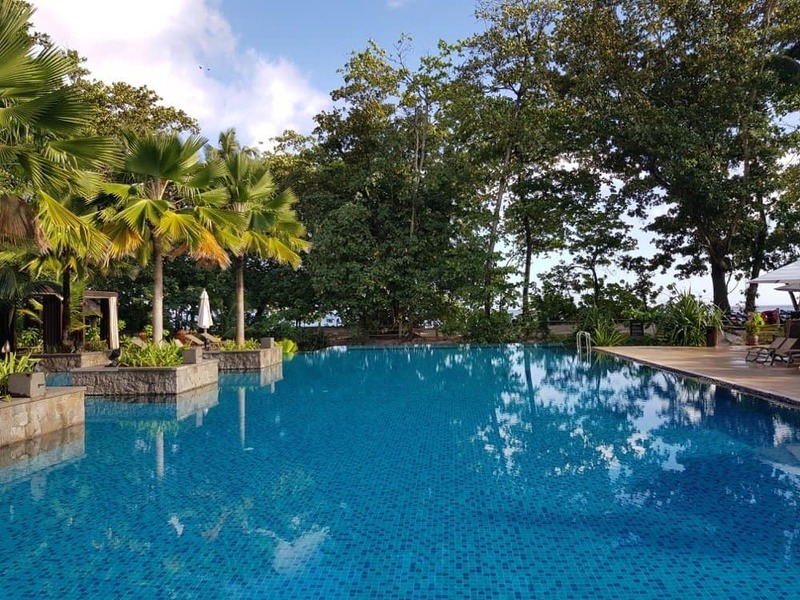 Given they don’t offer stunning views like other resorts but a combination of both and you have the perfect halal honeymoon in Seychelles. I believe the villas retail for about £700 a night and you can also find them on sale throughout the year directly or via a third party. Personally, I think it’s a great deal for the privacy they offer and the halal food all set on a beautiful beach. The resort has a pool for adults and also a pool for kids which was empty most of the time and I was tempted to use it as it was less busy. 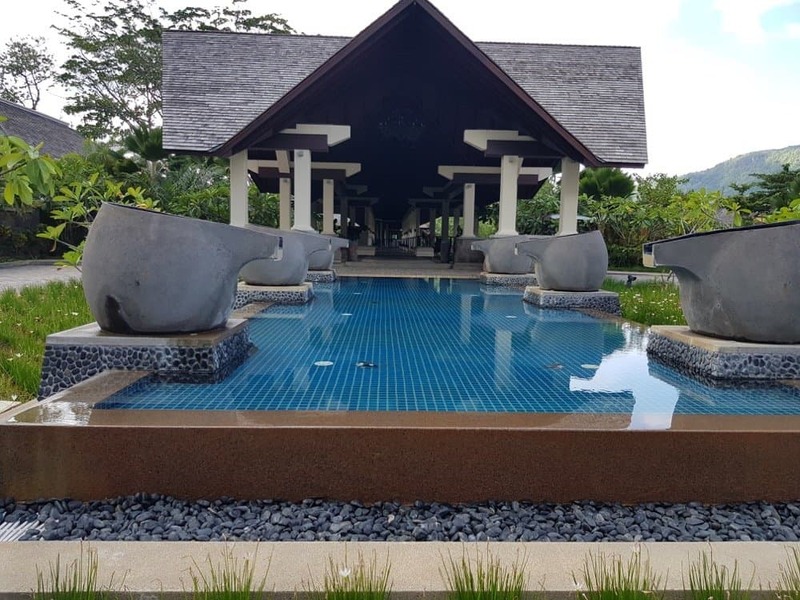 However, since the property is set on the beautiful Beau Vallon beach I felt it was really a shame to come all this way to use a pool rather than enjoy the beach. 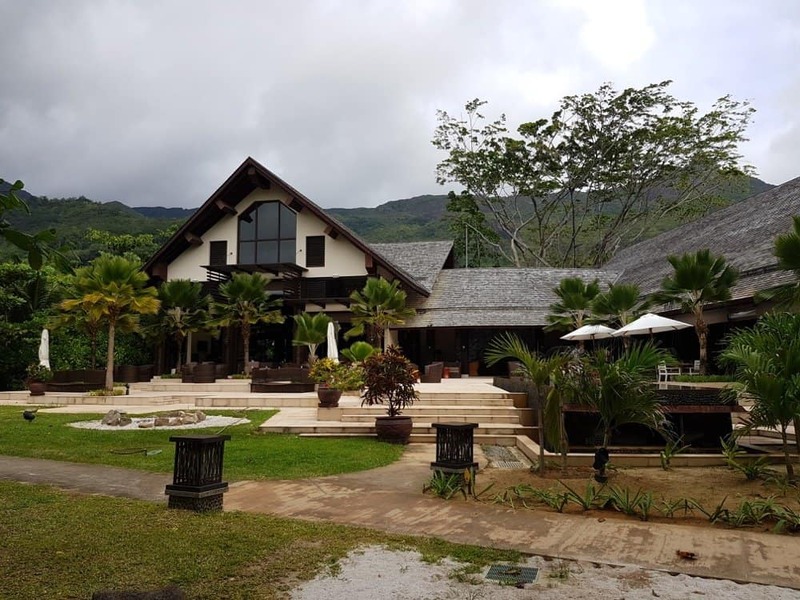 As the resort is spread across several acres offering plenty of opportunities to walk, explore and relax. 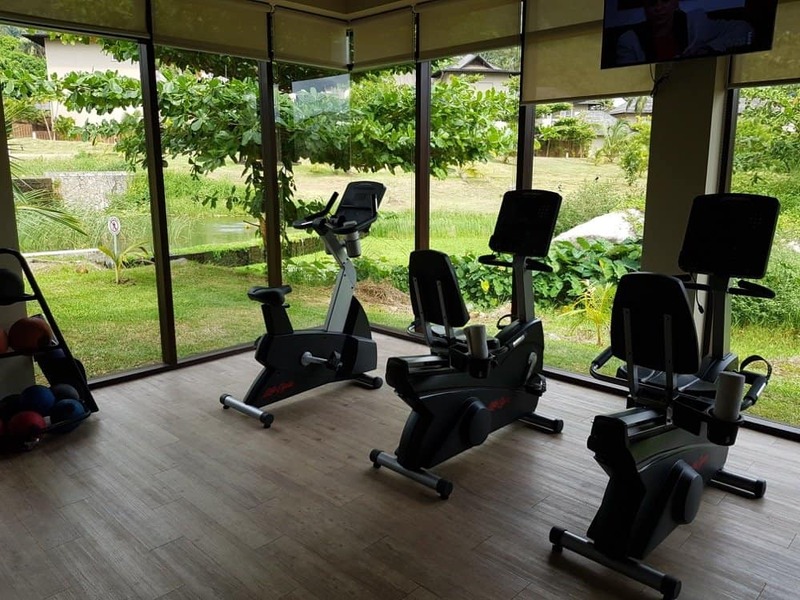 There are a gym, tennis court and Spa as well as free classes and watersports activities. You really can’t be bored there. 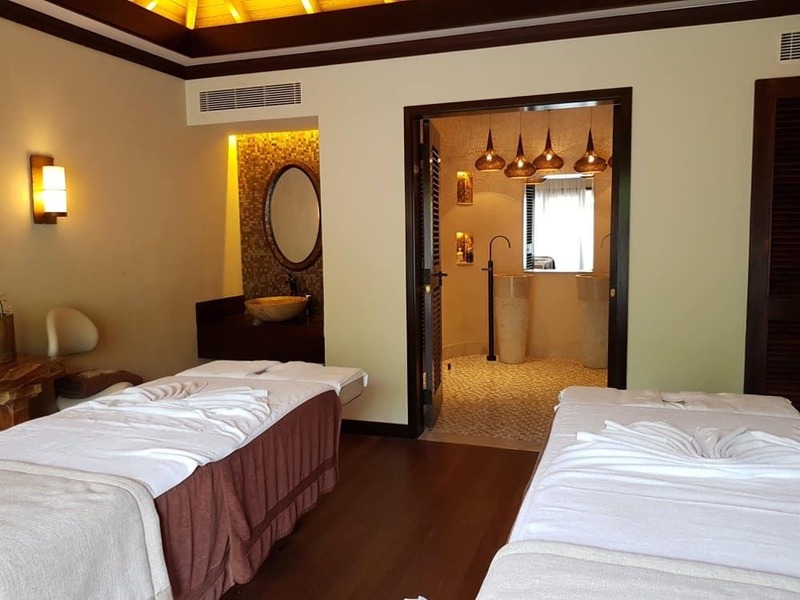 Upon check in I was given a $20 voucher towards a spa treatment and while walking around and exploring I discovered the spa and the fact that their prices were reasonable so I booked myself for one of the most relaxing experiences I have had in ages. I loved the fact that the treatment room had a private patio and I could sunbathe and also enjoy my tea. I did ask if I can stay a little longer and they were more than happy to accommodate me. 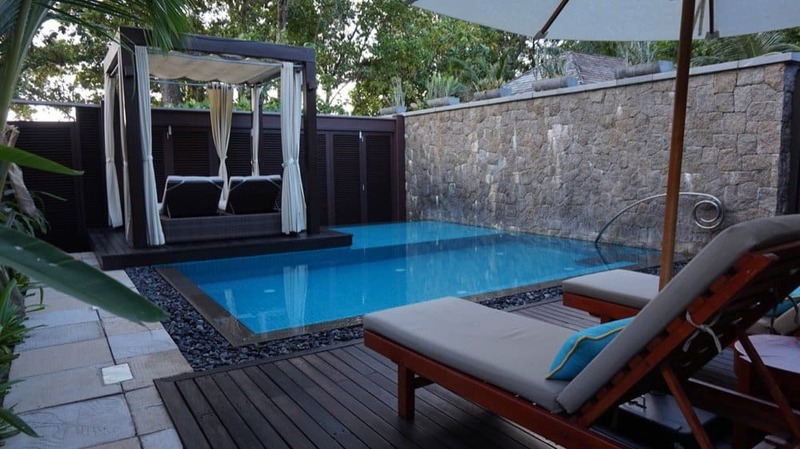 Even if I didn’t have a private pool villa I still managed to do some excellent sunbathing and relaxing in the Spa and on my daybed. 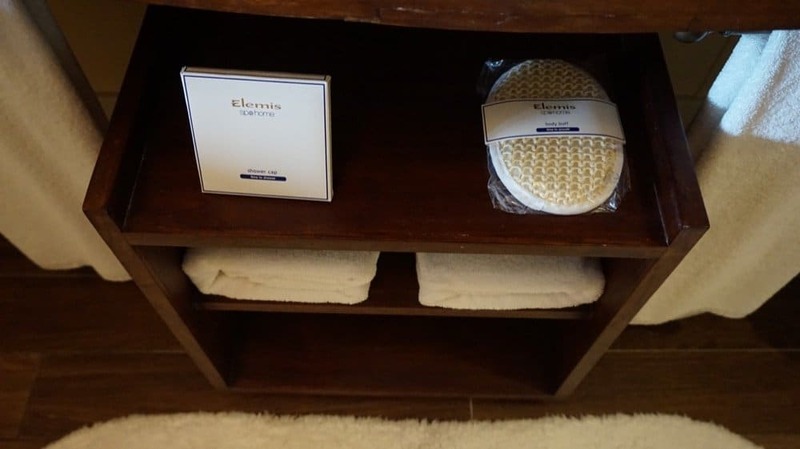 I felt totally relaxed and happy after my experience and I would highly recommend their rice scrub and massage. 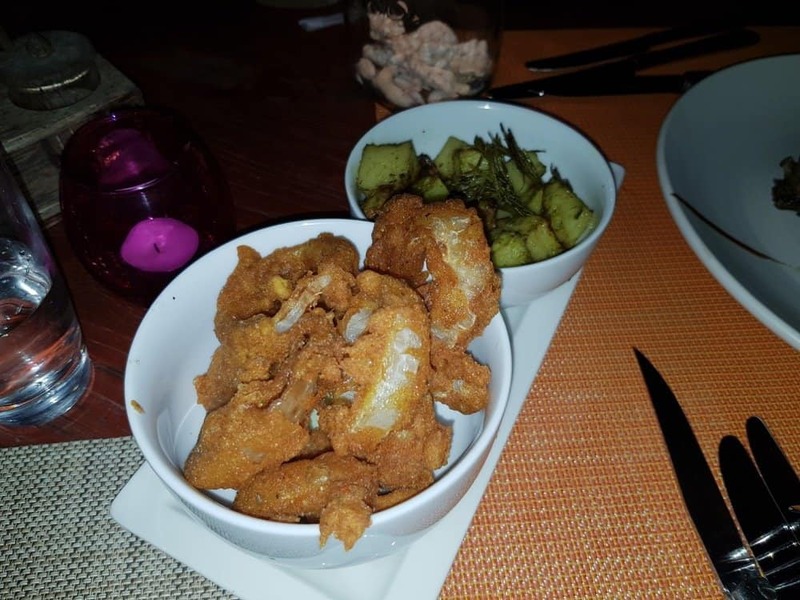 The resort offers 7 dining options you can choose from and we did try a couple of them. 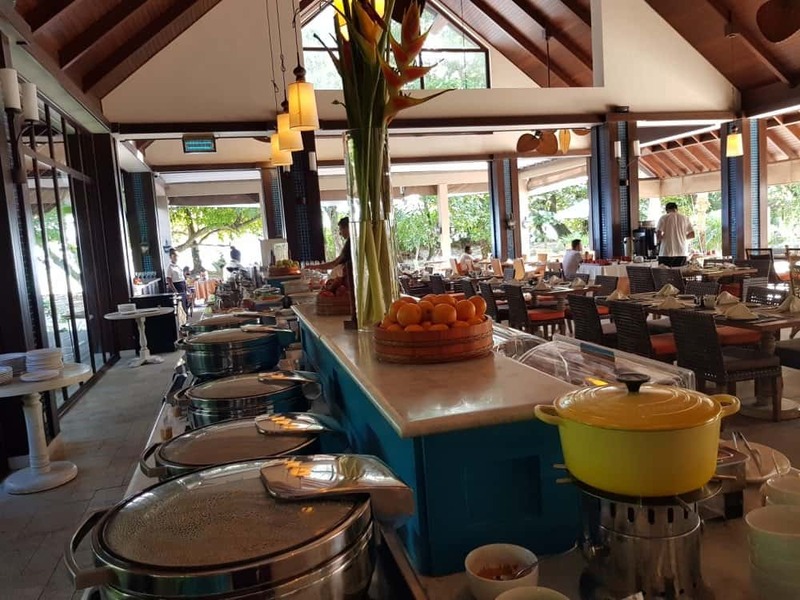 The food in the lobby lounge and on the beach was great. The prices I found were reasonable and I enjoyed the fact that it was World Cup time and we can join in on the atmosphere with the big TV screens showing the game. Reminded me of old times in Greece watching the games. The second night we tried the dinner option with one of their BBQ Grill restaurants and I have to say it was a little disappointing. 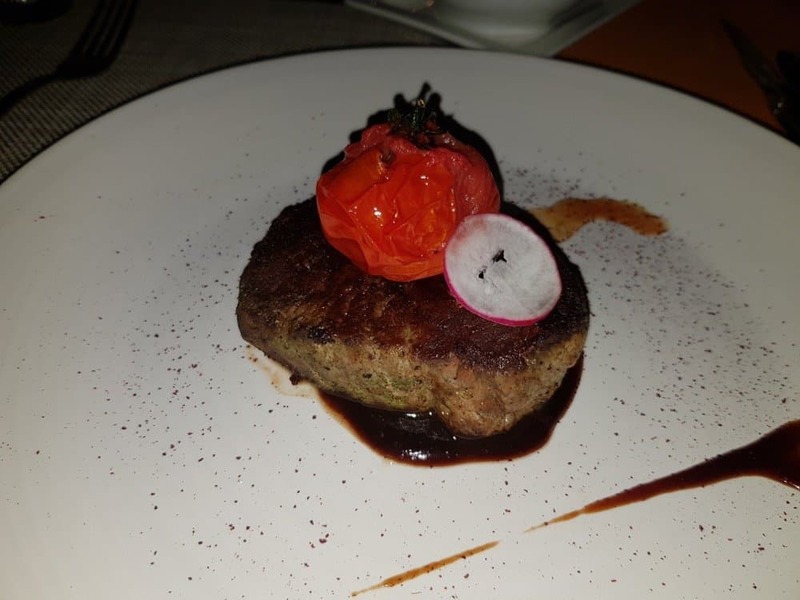 The ambience was fantastic, it is right on the beach, you can hear the waves and the place is very romantic with low light but our order took a little over an hour to be prepared and when it came the meat was inedible. Considering that this was their BBQ restaurant I thought it was actually very disappointing. Also, it wasn’t helped by the fact that the waitress didn’t offer anything when we complained and she did agree that the food was overcooked. To their advantage, the next day I did mention this to the Marketing Manager who profusely apologised and took it up with the chef. I really hope they improve the service because the restaurant setting is beautiful. 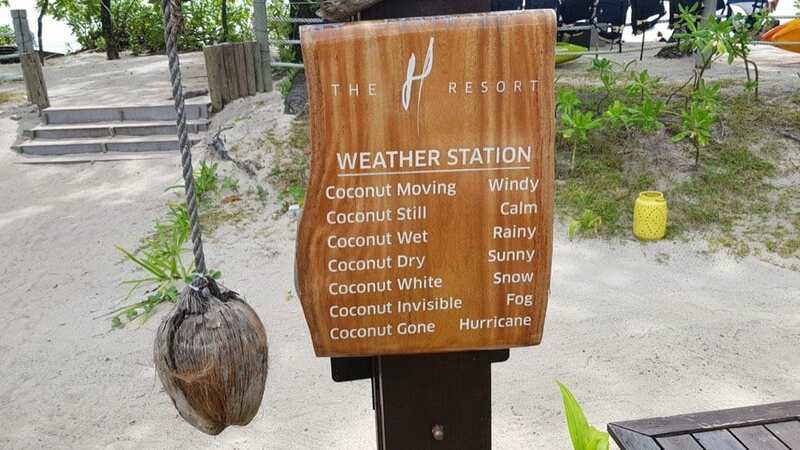 The H resort Seychelles has one of the best weather report systems I have ever seen and even now when I think about it it makes me smile. They have free water sports activities and equipment you can use and since the beach is fantastic there it is a shame not to. 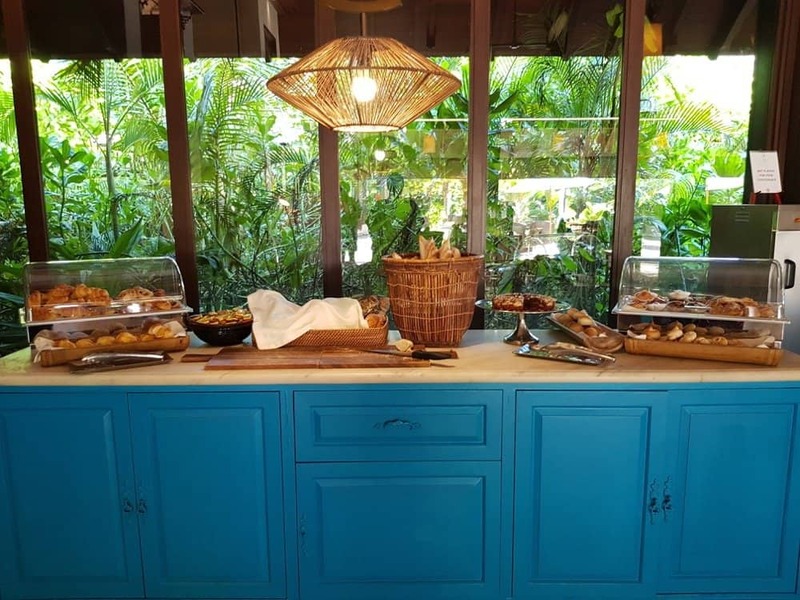 They also offer various activities within the resort such as salsa classes, yoga classes etc. We missed the Salsa class because I thought it was cancelled until I realised they had just started late. My mistake but it was a cool thing to do since the last salsa lesson I had was 15 years ago from my cousin who was a pro dancer. They also have table tennis next to the gym and we did enjoy 30 minutes of an intense game where basically I won. 😉 – Ok my husband won, but it was good fun. 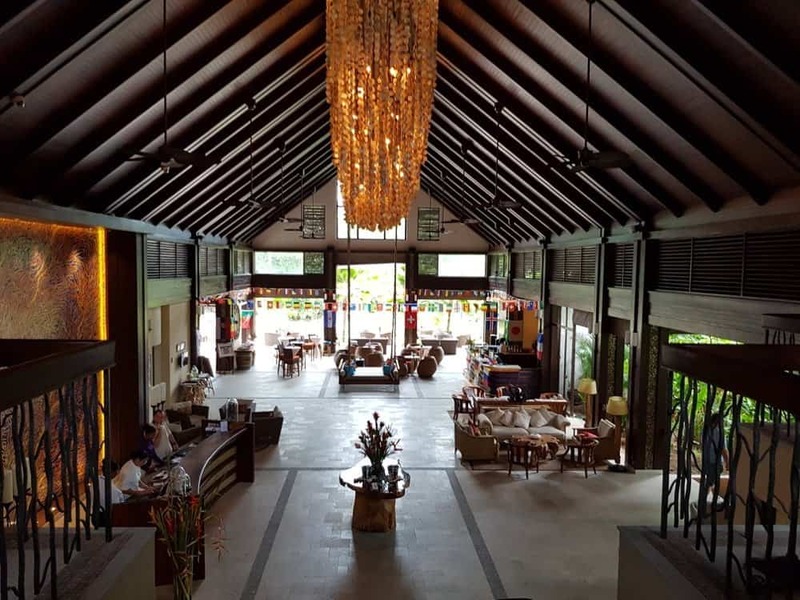 Overall I really liked my stay at the H resort Seychelles and I would happily visit again. I think it offers a perfect location for exploring Victoria for a few days before heading out to the rest of the islands. 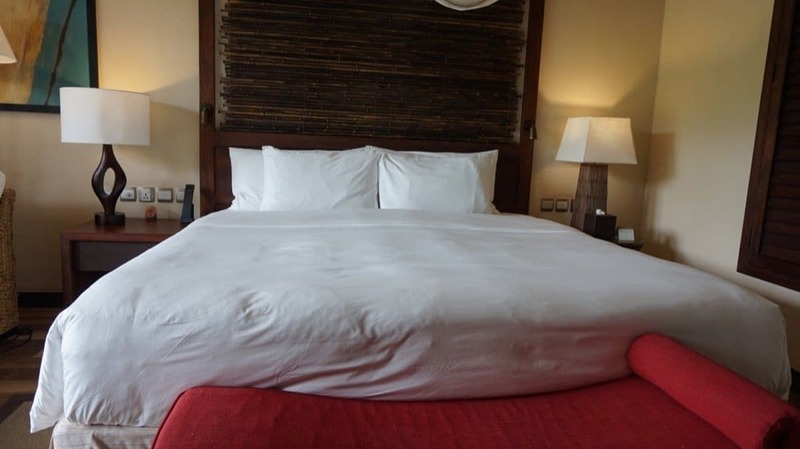 It is a very good solid 4-star hotel set on a beautiful beach with plenty of activities to keep you occupied. 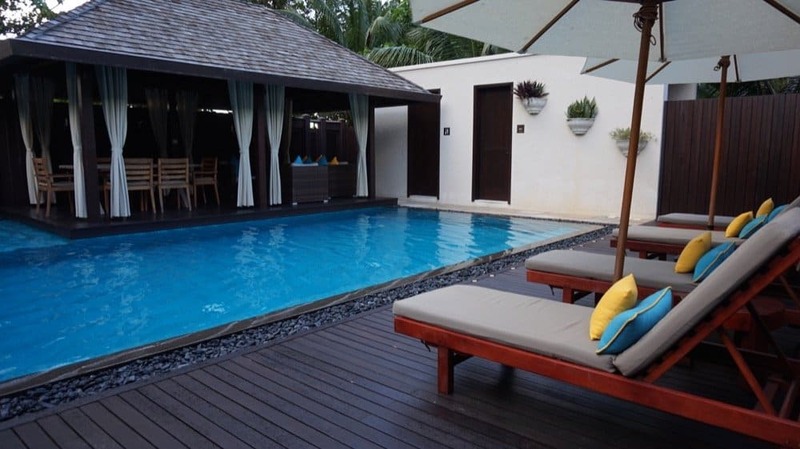 The private pool villas are stunning and the best option for a halal honeymoon and relaxing by the pool before exploring more of the islands. 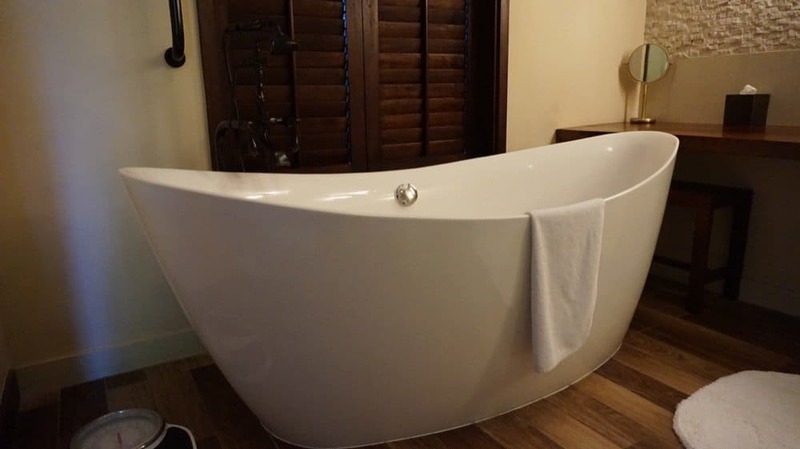 For the price and location, I think they are a choice that won’t disappoint you at all. 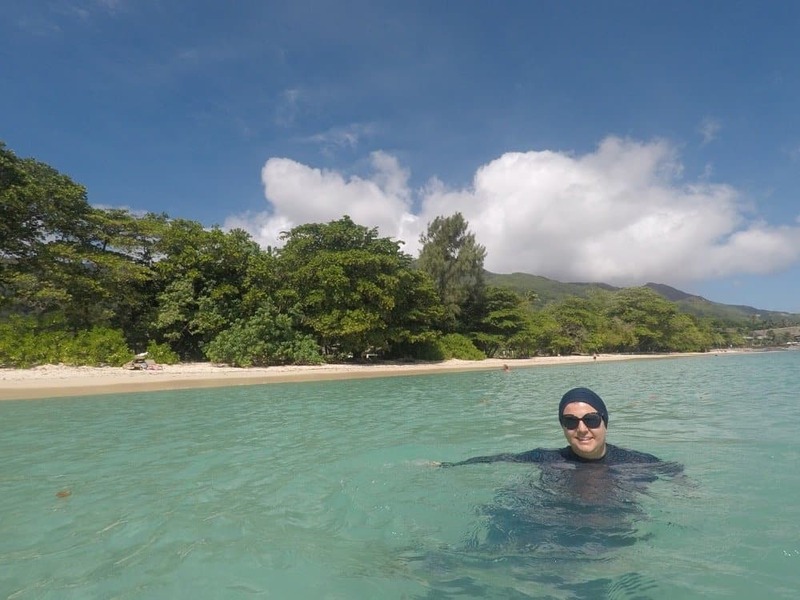 I was a guest at the H Resort Seychelles as part of discovering Muslim-friendly hotels in Seychelles but all incidentals and this review are mine. 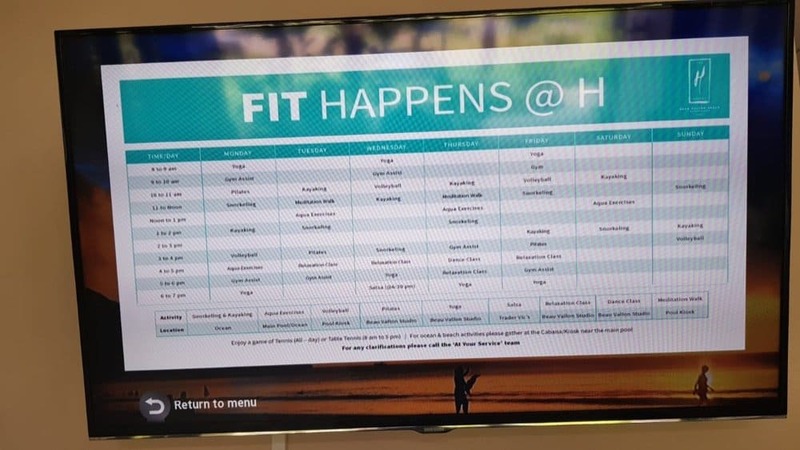 I received no direction or even a question about my content from the H Resort team.